The Mellon Foundation grant will fund the Humanities Pathways initiative at Oxford College and Emory College. The Andrew W. Mellon Foundation has awarded Emory University a three-year, $1.25 million grant to better prepare students to convert their academic pursuits into meaningful professional opportunities in a rapidly changing world. The grant will support the Humanities Pathways initiative at Emory College of Arts and Sciences and Oxford College of Emory University, Emory’s core liberal arts colleges for undergraduate students. It will provide comprehensive support to humanities faculty for the development of new and enhanced curricula, classroom experiences and course innovation. Michael A. Elliott, dean of Emory College of Arts and Sciences, will co-lead the Humanities Pathways initiative with Douglas A. Hicks, dean of Oxford College. Two humanities professors will serve as faculty co-directors of the Humanities Pathways project: Tasha Dobbin-Bennett, assistant professor of art history and studio art at Oxford College, and Peter Höyng, associate professor of German studies at Emory College. A growing body of data suggests that employers seek the abilities that are central to the humanities. According to employer surveys conducted by the Association for American Colleges and Universities, four out of five employers state that all college students should acquire broad learning in the liberal arts. More than nine in ten of those surveyed name competencies critical to the liberal arts, and the humanities in particular — competencies such as the ability to think critically, work in diverse teams, demonstrate ethical judgment and decision-making, and communicate clearly — as being most important when they make hiring decisions. Meanwhile, undergraduate students (and their families) can remain uncertain about the value of a degree in the humanities. “We seek to equip our faculty to confidently articulate how what we teach in the humanities can transfer to the professional realm, from the ability to analyze complicated documents and data, to making nuanced arguments informed by historical and cultural context to communicating effectively. We want our students to connect their learning in humanities to the non-profit, civic and business spheres,” says Hicks. A Humanities Connections program that will bring alumni with humanities degrees to campus to meet with students and serve as mentors for those who wish to pursue similar paths to various career fields. “Our undergraduates can benefit from speaking directly with leaders in the private and non-profit spheres whose paths as humanities majors have often been unpredictable yet rewarding and meaningful,” says Elliott. 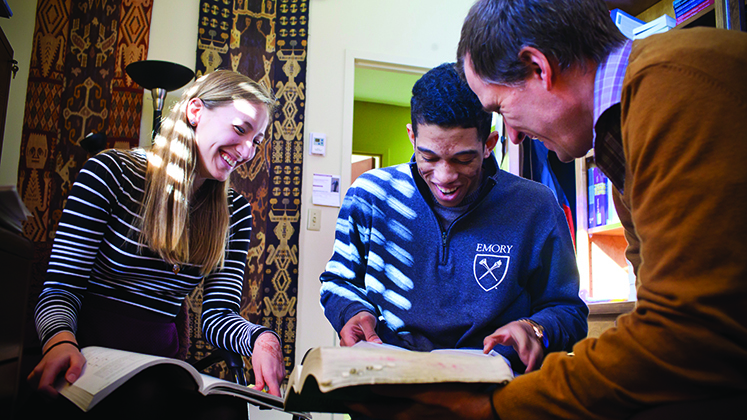 In addition, Emory’s location in Atlanta offers opportunities to forge partnerships with businesses, government agencies and non-profit organizations that could be replicated in other metropolitan areas — and to advance the goal of articulating the value of the humanities to leaders beyond the academy. In advance of the Humanities Pathways Mellon Foundation grant, both Oxford College and Emory College completed a successful planning process in spring 2018 that was supported by the Mellon Foundation to gauge the feasibility of the concept, gain faculty input and investment and specify program structure and proposed initiatives.